This is Gion. Gion is Kyoto’s most famous Geisha District, located around Shijo Avenue between Yasaka Shrine and Kamo River. It is filled with shops, restaurants and teahouses, where Geiko (Kyoto dialect for Geisha) and Maiko (Geiko apprentices) entertain. You may remember it as the scene of Arthur Golden’s novel Memoirs of a Geisha about Mineko Iwasaki growing up in Gion first as a Maiko and then a Geiko. It is a fantastic book that was adapted into a movie. As always the book is better. 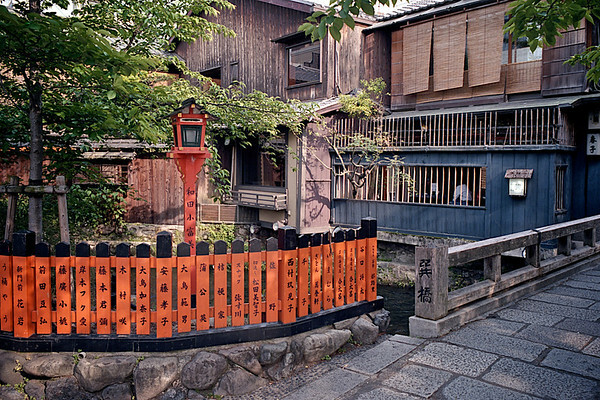 Walking through Gion you are quickly recognize key scenes from the book and movie.